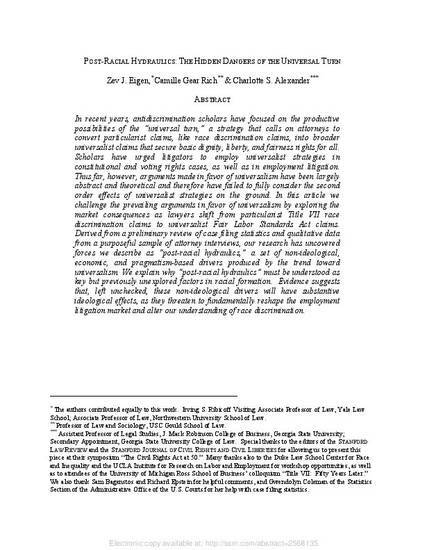 In recent years, antidiscrimination scholars have focused on the productive possibilities of the “universal turn,” a strategy that calls on attorneys to convert particularist claims, like race discrimination claims, into broader universalist claims that secure basic dignity, liberty, and fairness rights for all. Scholars have urged litigators to employ universalist strategies in constitutional and voting rights cases, as well as in employment litigation. Thus far, however, arguments made in favor of universalism have been largely abstract and theoretical and therefore have failed to fully consider the second order effects of universalist strategies on the ground. In this article we challenge the prevailing arguments in favor of universalism by exploring the market consequences as lawyers shift from particularist Title VII race discrimination claims to universalist Fair Labor Standards Act claims. Derived from a preliminary review of case filing statistics and qualitative data from a purposeful sample of attorney interviews, our research has uncovered forces we describe as “post-racial hydraulics,” a set of non-ideological, economic, and pragmatism-based drivers produced by the trend toward universalism. We explain why “post-racial hydraulics” must be understood as key but previously unexplored factors in racial formation. Evidence suggests that, left unchecked, these non-ideological drivers will have substantive ideological effects, as they threaten to fundamentally reshape the employment litigation market and alter our understanding of race discrimination.